Wow - did not see that coming. I took Fry to the vet this morning due to him having difficulty walking. He had returned from running the mountain bike trail with Steve last evening, apparently having torn the largest foot pads off full thickness on three of his feet. This was concerning enough, and we treated them with the standard medicated ointment the doctor has suggested before when this has happened. But even more worrisome was the fact that he seemed to be experiencing significant pain that kept him from walking or even wanting to stand up. 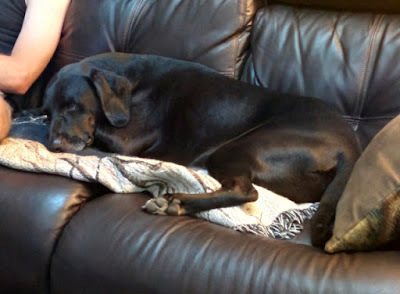 My first guess was that he might have strained a back muscle while running - he is a very athletic dog who likes to do a lot of fast sprinting, jumping and twisting (also how he likely tore his foot pads; doing that stuff on sandy rocky bike trails). We let him rest last night, and decided to see how he felt after some rest. He wasn't better this morning, so I called the vet's office as soon as they opened. They worked him in right away, and the vet suggested performing an x-ray of his spine under anesthesia to get a better picture of what might be going on, so Fry spent the day at the hospital, and I spent the day worrying. When we picked him up this evening, the vet told us Fry did in fact appear to have a very slight pinched nerve in his low back, but her biggest concern was what his labs showed: Lyme disease. I was stunned. I mean, I know he runs on the bike trails in the woods, and I know Lyme disease does occur in this area, but it honestly was not even on my list of suspicions for Fry's symptoms. We use flea and tick preventive on him, and are very careful to check him over carefully after any outdoor activity. Yes, he does have the occasional tick, but we always remove them promptly with tick pullers designed to remove the body and head cleanly, and never really thought about Lyme. Fortunately, the vet believes we caught the disease early, and started him on a three-week initial course of powerful antibiotics and pain medications, along with antiseptic foot soaks and antibiotics for his ripped pads. Needless to say, no running or exertional activity for a while either, which is going to be tough on such an active little guy. He's still unwilling to stand or walk unless absolutely necessary, and I'll be monitoring him for the next few days to make sure he's able to tolerate his medications. The vet says it's critical that he take (and keep down) his full dose of antibiotics to manage the Lyme disease since untreated it can lead to liver and kidney disease or even failure. He is scheduled for a return vet appointment in three weeks to assess his progress and decide on the appropriate course if additional treatment is needed at that time. Our little boy is resting at the moment, under the influence of very strong IV pain medications, and hopefully he will be able to tolerate his oral medicines well and be on the road to full recovery soon.